M4V video files that downloaded from iTunes are not able to be freely copied or played on non-Apple devices since they are DRM protected. Here you will get the most effective way to help you to remove DRM and convert iTunes M4V videos to various formats without any protections. How to burn iTunes M4V movies to DVD? The best choice is to convert M4V to VOB. This article will show you how to convert iTunes M4V movies to VOB with M4VGear M4V to VOB Converter on Windows. If you have an iTunes M4V video and want to extract the audio (AAC) from the iTunes M4V video file, the tool you probably need is M4V to AAC Converter. Among them, M4VGear iTunes M4V Converter is a must-try one. If you want to share the M4V video to PC friends, you need to convert M4V to WMV, Windows friendly format. Here introduces 2 ways of converting M4V to WMV with online M4V to WMV converter and M4VGear. Are you seeking ways to convert DRM protected M4V movies to MP3 format for enjoying those files on Windows Media Player, VLC or other MP3 players. Here we introduce a popular M4V to MP3 Converter with simple steps. Is there a way on a Mac/Windows to convert m4v to avi? This article shows you how to convert iTunes M4V video into AVI format video on Mac OS X EI Capitan and on Windows with powerful M4VGear M4V to AVI Converter. This article shows you a simple way to remove DRM from iTunes M4V videos and convert them to MOV format so that you can play your iTunes videos on QuickTime Player, Windows Media Player, VLC and so on. 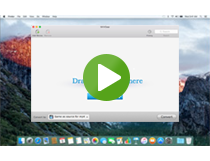 Here is a video tutorial for you to remove drm and convert iTunes M4V to MP4 step by step.